Chalet Guytaune is a lovely ski chalet in a withdrawn location outside of Morzine. The town centre and ski lifts are a 10 minute walk downhill from the chalet. The walk back to the chalet is uphill but there is a resort bus stop close to the chalet. 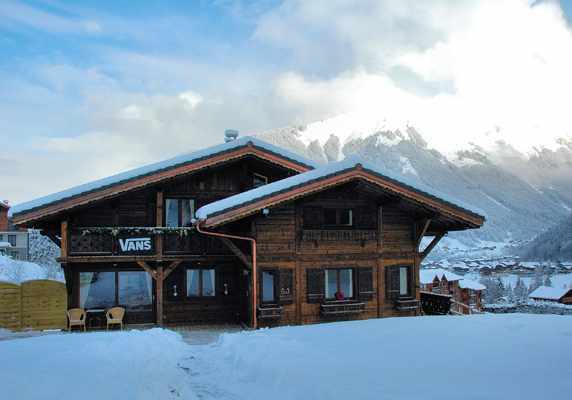 The chalet sleeps up to 16 guests in 7 bedrooms. The living room is spacious and welcoming thanks to the cosy log fire and comfy sofas. The chalet has plenty of toys for young and old, there is a Wii games console, DVD player, PC with wireless internet and a selection of board games. There is a even an outdoor hot tub offering stunning views over the surrounding areas. Arrive at your luxury ski chalet and enjoy a warm welcome, with champagne and canapés. Start your day with a wholesome breakfast to fuel your adventure, wherever it may take you. Return to the chalet for an exquisite, 4-course dinner and sommeliers selection of complimentary paired wines. As you enter the ski chalet in Morzine, you are greeted by a spacious lounge, with a roaring log fire and huge comfy sofas. This opens out to the dining area, and essential tea & cake island! For those wishing to spend the evening in the chalet there is plenty of entertainment available from the chalets Media Centre offering a Wii, DVD’s, board games, MP3 dock, PC, and wireless internet access. An ensuite bedroom with balcony completes the floor. Upstairs, there are three ensuite bedrooms all with balconies offering stunning views, plus a very large quad bedroom. In addition to the ensuite shower rooms, there is a further separate bathroom, giving you the option to have a relaxing soak at the end of the day. All the bedrooms offer ample storage space with large fitted wardrobes. The bedrooms all offer double or twin beds with the option of fitting in cots in some of the rooms. Sumptuous cushions and throws add extra luxury & comfort to the rooms, so much so you may be tempted to spend a relaxing day in your luxury chalet in Morzine, rather than on the mountains! A stunning property with plenty of reasons to book it, and not very many to ignore it.